Tone-Payton arrival at airport, 1951. Caption slip reads: "Photographer: Olmo. Date: 1951-10-02. Reporter: Looman. Assignment: Tone-Payton. 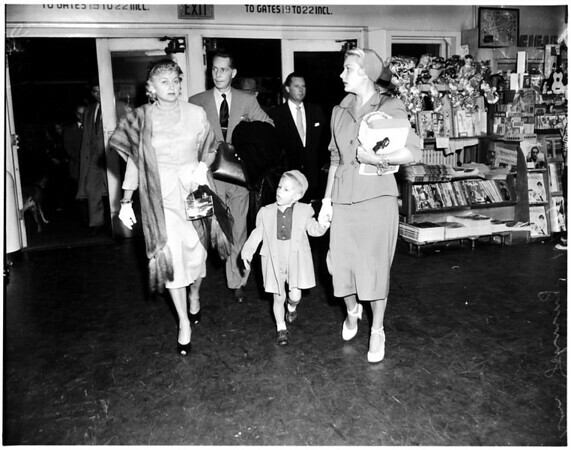 Arriving at International Airport: Franchot Tone and his bride, Barbara Payton, with her son by previous marriage, Johnny, 4. In some shots, Tone, Payton and Johnny are shown with Kent Modglin and his wife, June, with whom they were nightclubbing the night Tone was beaten by Actor Tom Neal".